The Embroidered Barbwire Comforter Set has a classic western look in neutral tones of brown and tan. The Embroidered Barbwire Comforter Set has a classic western look in neutral tones of brown and tan. The comforter is accented with and embroidered barbwire design around the outer edge Your set includes a faux leather dark brown beds skirt, two 2 tone pillow shams with a 3" flanged edge (1 with twin), two 18" pillow (1 with twin) and one 8" x 21" neck pillow. Dry cleaning is recommend for this set. 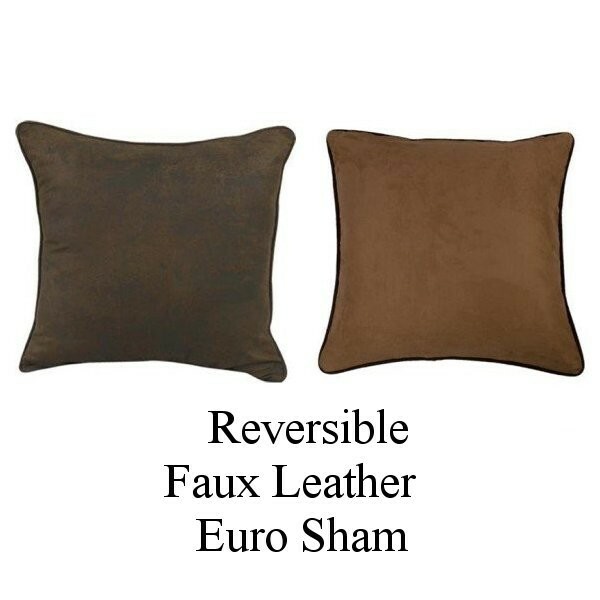 Faux leather euro sham measures 27" x 27" and reverse to faux suede (Pillow is not included).